NWI Food Council Board Member, Dominique Edwards, discusses food insecurity in NWI with attendees at LaPorte County Master Gardeners Brown Bag Series on local food. 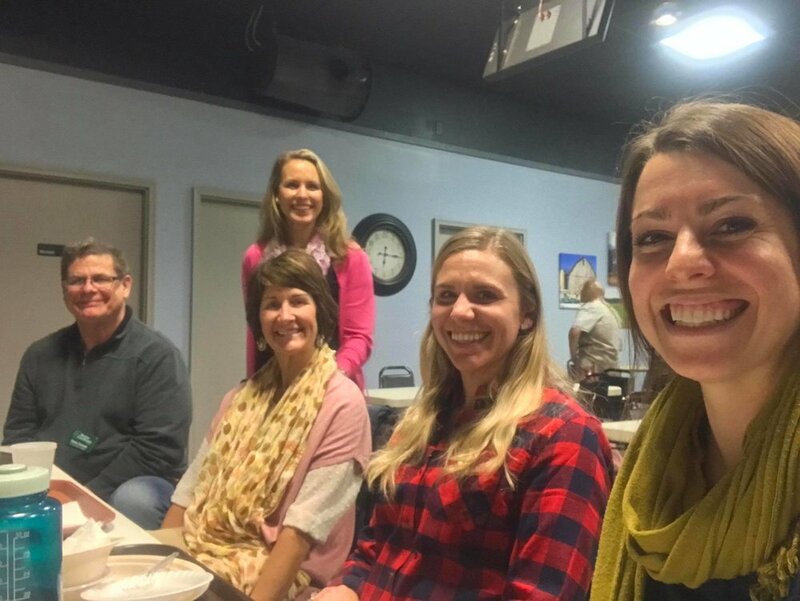 The LaPorte County Master Gardeners invited the NWI Food Council to join a panel discussion on local food at their first session of their Brown Bag Series. It was their largest turn out for a Brown Bag Series presentation with a few dozen in attendance, demonstrating strong community interest in the topic of local and sustainable food. 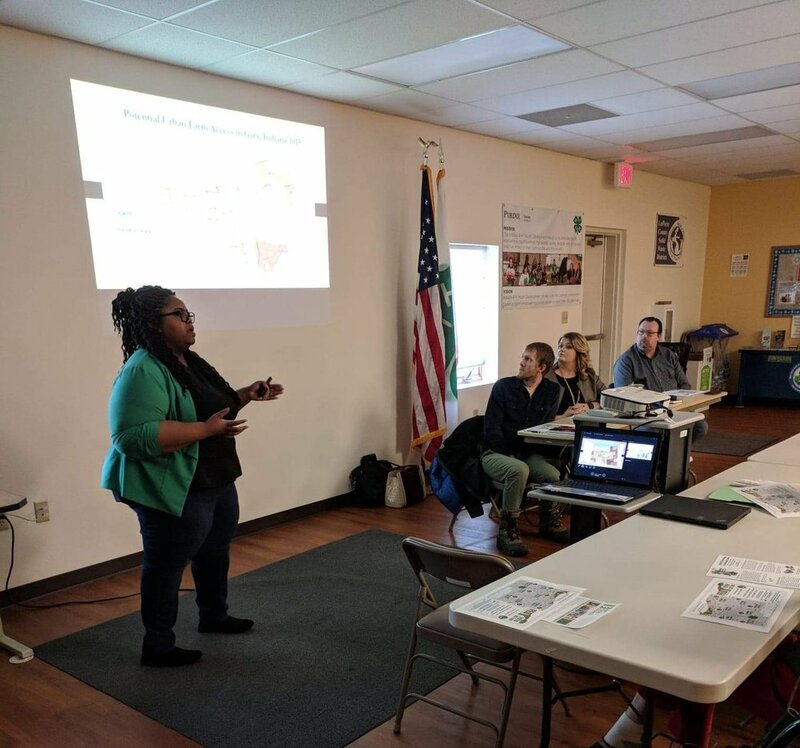 Dominique Edwards, board member with the NWI Food Council and food access expert, had the opportunity to speak about the council’s work and did a deep dive into the basic knowledge around food systems on a local and regional level. The conversation was enhanced as the panel and audience spoke about food insecurity, food access, food deserts, and food justice. Dominique shared her graduate research on Gary's food deserts and the current situation of food insecurity data in LaPorte County. The series wrapped with a discussion on ways to combat local food system disparities. Dominique was joined on the panel by Jason from the Pax Center, Damien Appel from Native Roots Farm, and Catherine Mrozinski-Langford from the LaPorte Farmer's Market. We were honored to be a part of this panel! The NWI Food Council volunteers for County Line Orchard’s “Farm to Table” each year to assist chefs with sourcing local ingredients from farms within our region. Our team also spends the evening helping chefs hand out tastings to patrons and working the impressive local cheese, apple and cracker station. It’s a wonderful evening with around 500 guests looking to sample the flavors of the season and the region! Legacy Foundation received a $226,119 grant from the United States Department of Agriculture to address food deserts in Gary and East Chicago. The Foundation partnered with The NWI Food Council, City of Gary Department of Environmental Affairs/Green Urbanism and Lake County Purdue Extension to apply for the USDA Farmers Market Promotion Program to address high rates of poverty and food insecurity in northern Lake County, Indiana. “Access to healthy food is something many of us take for granted. We can easily drive to the grocery store or visit our neighborhood farmers market and pick up fruits and vegetables, but there are so many in our community who lack the ability to do this. We think that’s unacceptable,” said Legacy Foundation President, Carolyn Saxton. Nearly 75,000 people in Lake County are food insecure, according to Map the Meal Gap, a Feeding America study. Food insecurity refers to a lack of access, at times, to enough food for all household members and limited or uncertain availability of nutritionally adequate foods. According to the USDA, there are 24 food deserts in Lake County and 14 of those are in Gary. That means that more than 33% of the population along the census tract lives over a mile from a supermarket or grocery store. The lack of access to nearby food in low-income areas is often worsened by financial and transportation barriers. The new three-year program will add food markets and mobile markets for residents in Gary and East Chicago and increase the number of farmers markets eligible to accept benefits from the Supplemental Nutrition Assistance Program (SNAP). Currently, there are only two SNAP eligible farmers markets in the city of Gary. Through this program, new farmers markets will be created in both Gary and East Chicago and capacity will be expanded for a Gary farmers market. All eight farmers markets already operating throughout Lake County will receive capacity building and technical assistance. The project aims to increase consumption of and access to locally grown produce for residents in food deserts. It will expand marketing, outreach, technical assistance, education and local sales for farmers, and create a mobile food market to reach residents in at least half of the 24 food desert census tracts. In the coming fall and winter seasons, Legacy Foundation and partners will work to get local urban farms eligible to receive SNAP benefits. New farmers markets and the mobile market are slated to begin in the summer of 2019. 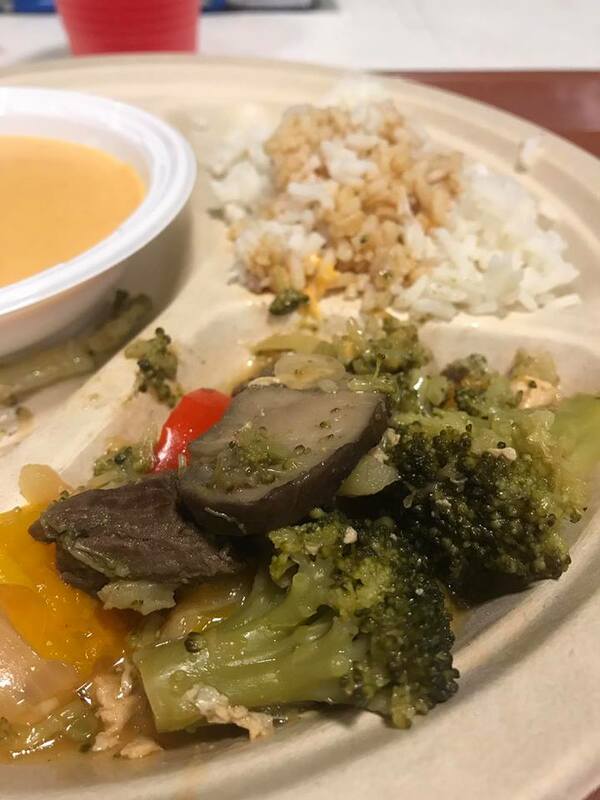 In case you hadn’t heard: besides getting healthy local food on your child’s school lunch plate, the farm-to-school movement is now reaching cafeterias of all kinds! Colleges, pre-schools, prisons, hospitals—food activists around the country are working with local growers to connect the dots in our food economy. Elias Crim, NWI Food Council board member, had the opportunity to attend this excellent biennial event, hosted by the National Farm to School Network. It brought together a diverse group of food service professionals, farmers, educators, students, representatives from nonprofits and government agencies, public health professionals and more for three days of learning, networking and movement building. Interestingly, the mood was more like that of a political movement than a professional conference! Keynote speakers included Rodney K. Taylor (a pioneer for establishing the “Farmers’ Market Salad Bars” in California schools—back in 1997!) and Haile Thomas (17-year old speaker, health activist, and Food Network chef). From our NWI area, Josh Craig, media specialist (and F2S activist) at Munster High School also attended. We hope to work with his school—which already has a F2S program underway--in our future NWIFC activities in this area. The overall impact of these F2C programs is to support local agriculture, address inequities in the food system and foster a culture of food literacy in the community. Nationally, according to the Farm to School Network, some 42,587 schools (about 42% of all U.S. public schools) now have F2S programs, with 23.6 million students engaged. These schools in 46 states are now spending $789 million on local food. The latest Indiana Department of Education data indicate that 31% of our state’s schools have a farm-to-school program of some kind in place (many states are now well over 50%), with local food representing an average of 18% of the school lunch budget, and 29% of all Indiana schools now offering a school garden program. Lots more work to be done!